Tom Duquesnoy has dominated the regional scene of mixed martial arts and he made the transition to the octagon for the first time at “UFC on FOX 24”. Duquesnoy hoped to make an impactful debut in his first fight on such a grand stage, but Patrick Williams said he would do anything he could to derail the hype train. Williams possessed a massive reach, and tried to take advantage of that in the opening moments of the round. He charged toward Duquesnoy and fired off three wild shots which all missed. It didn’t take Williams long to take this fight down to the mat, but Duquesnoy was quick to get right back up to his feet. Williams changed his attack and concentrated on the body of Duquesnoy, hoping to drive the energy out of him early on. 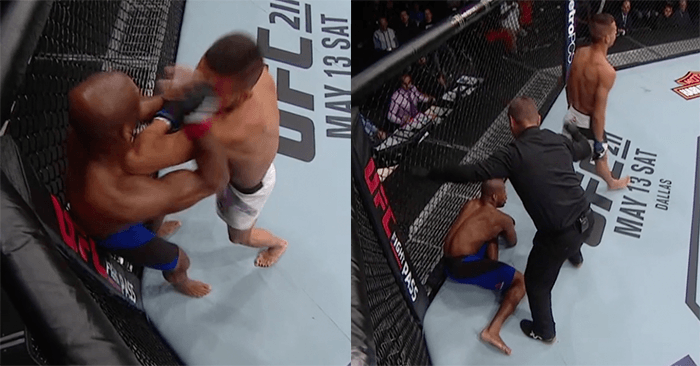 With his back against the fence, Williams cracked Duquesnoy with a straight right that dropped him to one knee. Duquesnoy got right back up and tried to escape the flurry, but Williams backed off and decided not to blow his wad. Williams took a massive breath with a minute remaining while his hands were at his side, which called for Duquesnoy to pick up the pace and push it so it made Williams uncomfortable. Williams took deep breaths with his hands on his thighs, and he was dropped in the final seconds of the round with a massive knee to the face. The fight cut to commercial, but it was decided in-between rounds that Williams wasn’t fit to continue. Williams was VERY exhausted, and you could tell it was only a matter of time before Duquesnoy scored the knockout win.